Meet at: Farmhouse Parking lot, 1701 Linvale-Harbourton Road, 08530. Guided Trail Walk, to begin at 9 am. Firm Ground, Winter Birds and Open Spaces.. for more info see the post Fall Trail Running.. Please RSVP to North Slope Farm to confirm your participation! at the Farmhouse, 1701 Linvale-Harbourton Rd (Route 579). Our Fresh Eggs and Juice and Produce as conditions permit.. If considering joining us, please call ahead of time to confirm! 609-460-4636 – pls leave brief message with number to receive return call. Throwing Rotten Tomatoes at each other, though somewhat violent, seems like a reasonably ok way to strive..
1)Tomatoes should splat.. If they are hard, they should be crushed before throwing, if with Stem – remove stem. 2)Only those who are prepared to be SPLATED, should enter the Tomato Fight Area. No later than 7pm, probably earlier, all participants will be brought to the Tomato Fight area and Warned..
and Stung by Stinging Nettle !! All are Welcome – if its your first time – seek out Yellow T-Shirted folks for orientation ! Wear sneakers, close toed shoes, that you dont mind never wearing again! Introduce yourself to Farm Staff and Friends (wearing Yellow T-Shirts) – ask for Mike, for official welcome..
Come prepared to relax or strive, or both, enjoy the evening !! Hosted at North Slope Farm, farming organically for over twenty years, in the Garden State of New Jersey. Wednesday September 7 ; 3 pm – 5 pm, followed by discussions, music and refreshments at our Farmstand (1701 Linvale-Harbourton Rd). Closest intersection – Route 579 and Rock Road East, Between Routes 518 and 31. There will be a presentation of important information for growers and food handlers, followed by a tour of North Slope’s food handling operation, focusing on the topics and questions raised. Following the event, participants are encouraged to linger and enjoy some live music and light refreshments. June 20 – Monday 7 pm into the night… Got kids? bring em early for a swim, we’ll be probably be there swimming too, take a walk on the farm, down to the pond, check for ticks! Winter is truly gone now and Summer is Here. Over the Years, The transitions surprise me, as they often have already happened, and are moving on to the next season, before I really know it! SO we gather, to take a moment in the rush, to honor the Sun, and our relation to it – and we hope you’ll come celebrate this special time with us. We’ll be chilling by the pool, the grill will be hot for you to throw something on to eat, there will be salads and desserts that the community brings to share. Bring a blanket, frisbee, lawn chair, enjoy the evening and our shared world – Happy Solstice to ya – Hope to see you there ! Salatin, Joel. Fields of Farmers. Virginia: Polyface Inc. Someone who does work for you (the employer). Someone who follows your directions and instructions. Someone who uses your tools, machines and facilities. Production problems are almost always traced back to nutrient imbalance in the soil. Starting the conference with the practiced wisdom of Dr. Heckman was good for me, as the following workshops built on the assumption of a fertile and balanced soil. Of course, the process starts with a soil sample – the tested results of which will highlight the pH of the soil and significant deficiencies and high concentrations. Dr. Heckman strongly urges Organic Farmers to seek to build and maintain Nitrogen fertility thru the establishment and maintenance of cover cropping and establishing rotations that allow the establishment of “perennial” pasture, including legumes. The perennial pasture could be simply increasing the cover cropped period, of a field, from one season to two. Dr. Heckman emphasized the significant improvement in Nitrogen fixation compared to a single season. Some other items of note for our planning included a Calcium Silicate material – Wollastonite (mined in NY state), that has shown profound suppression of powdery mildew, probably due to the Silica. The material can be used to raise the pH, similar to lime, and would serve to bolster Calcium levels at the same time. Calcium was highlighted as being important to improve “tillith” or the crumb structure of the soil. Dr. Heckman also discussed using 1-2 tons per acre of Gypsum, combined with compost or manure to bolster Calcium levels, if needed. Sulfur was discussed as being important for vegetable taste and Amino Acid (protein) benefits. A rate of 20-14 lbs per acre was mentioned. Finally, Dr. Heckman stressed the valuable step of utilizing Plant Tissue Analysis, especially in perennial Fruit crops, to monitor Fertility balance or imbalance. 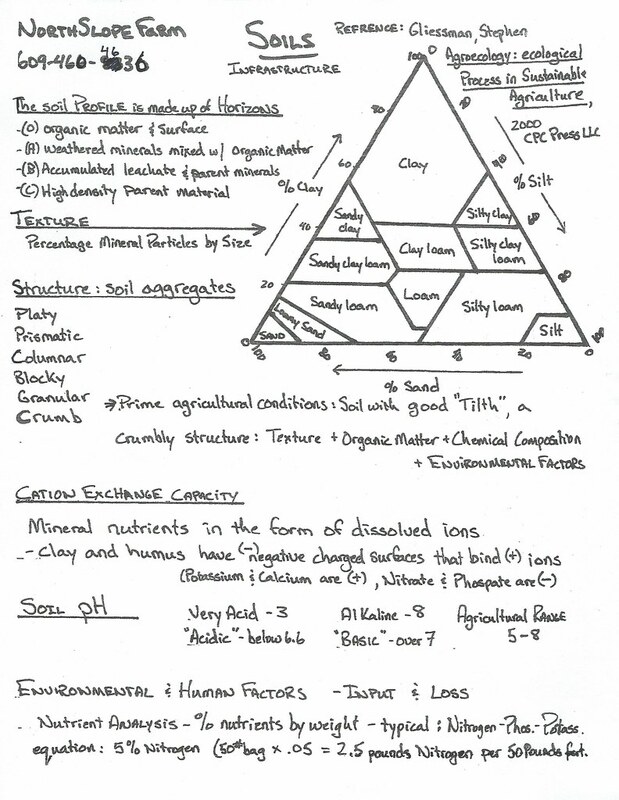 He recommended a Plant Analysis Handbook, and recommends sampling Plant Tissue in late July – early August. His work and contact info can be accessed at the NJ Agricultural Research Station website. Dan Kitteredge, Bionutrient Food Association. What struck me in Dan’s presentation was the assessment of production systems being given a failing grade when struggling with disease and low yields. That the focus should not be on, how to deal with problems, but to avoid them all together through sound care of our soils. Dan discussed the core principles of Air, Water and Temperature, as relates to soil and maintaining active life in the soil. The soil microorganisms are in tight bonds with plant life, cycling energy, nutrients and gasses that yield healthy production. The organisms need to be able to breathe, and due to very short life expectancies are very susceptible to the common agriculture devastation of tillage and bare soil cultivation. My take away from Dan’s presentation was that the improvements we’ve seen at North Slope Farm, with our Favorable Furrows and Permanent Raised beds, are just the beginning of our journey towards Ecological Agriculture, and that the journey will be life altering. Treating the soil better, avoiding the traps of modern agriculture with its reliance of large production areas, big machinery and expensive off farm imputs, will result in more reliable long term production, reduced costs, and probably significantly increased actuall yields of nutrient rich food and crops! Bryan O’Hara, Tobacco Road Farm, Lebanon CT.
Bryan’s talk was the perfect complement to the previous fellows, as he showed the effect of the previous speakers points. He stated the importance of working with fertile and balanced soils, then went on to describe a production system that was music to the small farmers ears. “No-Till” used to make me think of massive tractors and heavy implements, not any more. Bryan mows cover crops and crop residue, with a small scale mower, then covers the area with clear plastic for one to two days. In that time, the vegetation is “solarized” or killed by the suns insolation, and he replants with minimal effort and negligible weed problems. Bryan uses compost to lightly dress the area to be seeded and chopped mulch to lightly cover any bare soil. By necessity, the area he treats is “small” (square feet as opposed to acres), due to the intensity of hand labor and process, from covering with tightly anchored sheets of plastic, compost application by hand, scattering vegetable seed by hand and light, but careful mulching with finely chopped material. I missed his description of working with Indigenous Microorganisms (IMO), but integral to his practices, is the fostering of a MicroBiologically active soil. His testimony strongly advocates the management of adding and fostering MicroBiology to the no till system. His microbe rich soil discourages the use of large, disruptive equipment, and yields crops with annual reductions in irrigation and weed control needs. Bryan referred to Korean agricultural practices and Hawaiian resources for the development of a “grow your own” Indigenous Microorganism System, and on the strength of his example, we will be pursuing this topic at North Slope Farm, to share with every new farmer we train, as well as, to build the resilience and vitality of our soils and production systems! The need for on Farm processing facilities is a function of taking the investment we make in production, all the way through processing to the final product. Too often, hard work, gently raising livestock, is lost when the only way to process them is to drive hours away, based on an arbitrary schedule, and hand them over to a system designed for efficiency rather than Humane treatment and preservation of product purity. In the interest of human safety, regulations requiring standardized protocol, process and design can limit the ability of a farm to handle their product independently. Jon described his operation’s investment in controlling the whole process – which serves their goal of humane treatment of animals for food, keeping the animals close to their familiar surroundings and caretakers. The operation at Double Brook Farm sets a high bar for a new operation to invest in independence and their experience will impact our region for years to come! “Its Complicated, and It Depends..” I felt like I gained a basic understanding of food safety – Criteria to Consider, and I was glad to have taken the workshop. pH, Water Activity and Temperature are the defining issues in food safety, and each product can be assessed by these criteria. Each product will have a distinct pH, or level of acidity. pH of 2 is our stomach acid and lime juice, 5-6 are meats, 5 for carrots, 4-5 for tomatoes.. Below pH 4.5 is the magic point at which many illness causing spores will not flourish (to over simplify). Water Activity is measured on a scale of 0 – 1, and describes relative humidity of foods, packed in a container. The lower the Water Activity, like a dried herb, the less the food safety concern, the higher, like a container of soup, the greater the concern. Adding sugar or salt can reduce water activity (probably why there is so much in processed foods). Temperature is important as it relates to limiting illness causing organisms from growing, in refrigeration, and eradicating bad bugs through high temperatures which kill them. Dr. Schaffner encouraged us to read the NJ Department of Health State Code Chapter 24 to gain a starting point when considering how to handle a product. We were also encouraged to reach out to the State and County Health Departments for guidance. Other suggested resources included; National Center for Home Preservation, Rutgers Innovation Center, NE Center for Food Entrepreneurs (Cornell), Cottage Food Law, Association of Food and Drug Officials, USDA Small Business Innovation and Research, ATTRA and Food Safety Certification (on-line course). More imposing but core to understanding regulations; FDA CFR 21 and USDA CFR 9.